So Mom, where are we going today? To the Exploratorium up in the city. Oh, you know, where you get to do different sorts of experiments with stuff. Oh, like when you get to touch something and then see what happens. Oh, you mean, like...cause and effect? Um (turn around and stare at daughter)... Yes, like cause and effect. Someone else has a great effect around here. 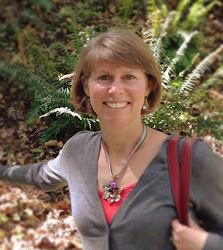 Here name is Debbie Dubrow and she hosts a weekly link exchange of photos from all over the web. Go tinker around her site, you'll find plenty of travel inspirations! I wish they'd had more of these hands-on types of places where I was a kid. what a fun photo - i LOVE those huge bubbles!! and a great idea, for both travel and having fun. You know what I love ... I grew up going to the exploratorium and things like the bubble maker and the shadow box bring back old memories. I love it. you've reminded me that we need to get back there—such a fabulous Bay Area sport with kids. That looks like fun! I love hands on experiments for kids, they are a great way of learning. Wow Lorraine, your posts have been absolutely smokin lately! So much fun to read and amazing pictures. Loved the art museum and of course the Exploratorium is one of my favorite places. Hoping to bring the kids for a visit this summer!